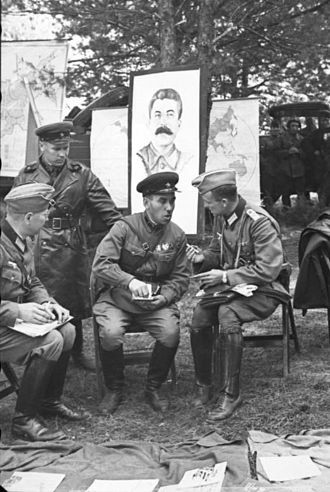 The military rank of Marshal of the Soviet Union was established by a decree of the Soviet Cabinet, the Council of People's Commissars (Sovnarkom), on 22 September 1935. 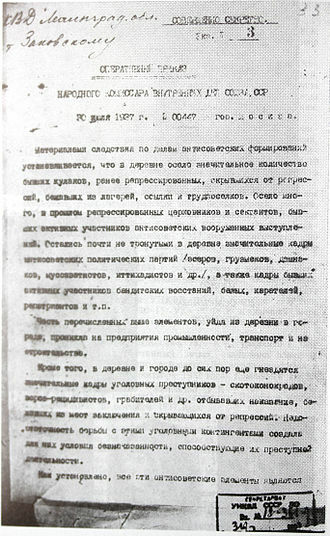 On 20 November, the rank was conferred on five people: People's Commissar of Defence and veteran Bolshevik Kliment Voroshilov, Chief of the General Staff of the Red Army Alexander Ilyich Yegorov, and three senior commanders, Vasily Blyukher, Semyon Budyonny, and Mikhail Tukhachevsky. Of these, Blyukher, Tukhachevsky, and Yegorov were executed during Stalin's Great Purge of 1937–38. 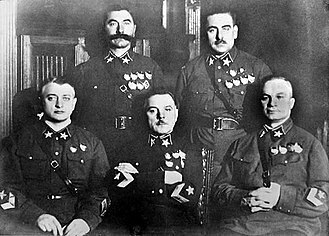 On 7 May 1940, three new Marshals were appointed: the new People's Commissar of Defence, Semyon Timoshenko, Boris Shaposhnikov, and Grigory Kulik. 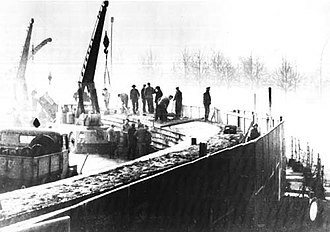 Two Marshals were executed in postwar purges: Kulik in 1950 and Beria in 1953, following Stalin's death. Thereafter the rank was awarded only to professional soldiers, with the exception of Leonid Brezhnev, who made himself a Marshal in 1976, and Ustinov, who was prominent in the arms industry and was appointed Defence Minister in July 1976. The last Marshal of the Soviet Union was Dmitry Yazov, appointed in 1990, who was imprisoned after the failed coup against Mikhail Gorbachev in 1991. 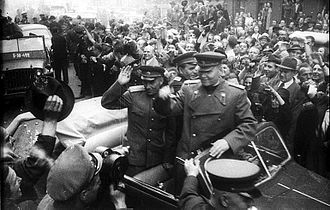 Marshal Sergei Akhromeev committed suicide in 1991 during the fall of the Soviet Union. Those who had gained their reputations during the Russian Civil War. 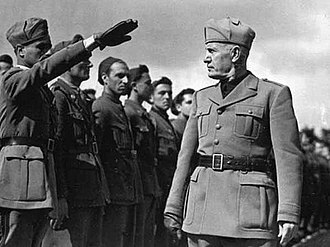 These included both those who were purged in 1937–38 (Blyukher, Tukhachevsky, and Yegorov), and those who held high commands in the early years of World War II (Budyonny, Kulik, Shaposhnikov, Timoshenko and Voroshilov). All of the latter except Shaposhnikov and Timoshenko proved out-of-step with modern warfare and were removed from commanding positions. 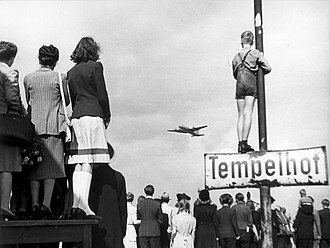 Those who made their reputations in World War II and assumed high commands in the latter part of the war. 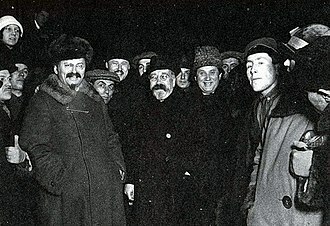 These included Zhukov, Vasilievsky, Konev, Rokossovsky, Malinovsky, Tolbukhin, and Govorov. 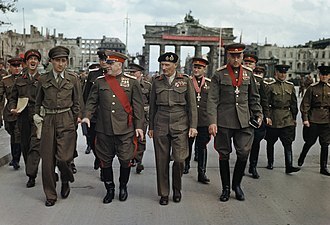 All Marshals in the third category had been officers in World War II, except Brezhnev, who had been a commissar and Ustinov, who had been People's Commissar for Armaments. Even Yazov, who was 20 when the war ended, had been a platoon commander. 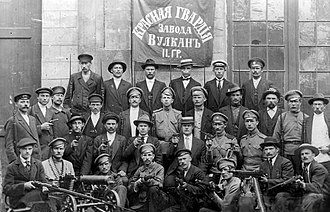 Note: All Marshals of the Soviet Union, with the exception of Non-Military Marshals, had at least started their military careers in the Army. The Service Arms listed are the services they served in during their respective tenures as Marshals of the Soviet Union. 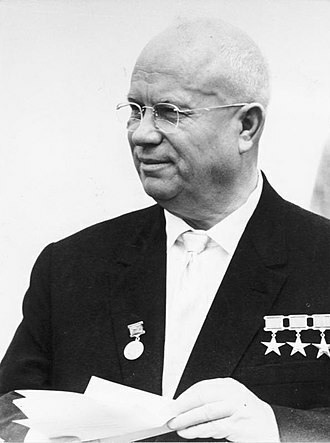 Dmitry Timofeyevich Yazov was the last Marshal of the Soviet Union to be appointed before the collapse of the Soviet Union. 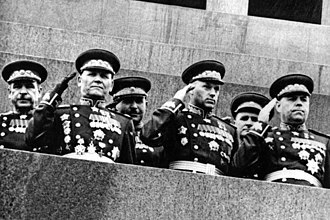 He was the only Marshal of the Soviet Union to be born in Siberia, a veteran of the Great Patriotic War, Yazov is the last surviving Marshal and the only one not to have been awarded the title Hero of the Soviet Union. In 1971–1973, he commanded the 32nd Army Corps in the Crimean region of the Odessa Military District, in 1979–1980, Yazov was commander of the Central Group of Forces in Czechoslovakia. He held the post of Soviet Defence Minister from May 1987, in 1987–1990, Yazov was a candidate for membership in Politburo. He was a key part of Black January, Yazov was responsible for deployment of Russian OMON commando units to Latvia and Lithuania in early 1991. 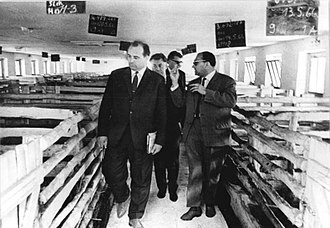 During the August Coup of 1991, Yazov was a member of the State Emergency Committee, during the Yeltsin period Yazov was prosecuted and acquitted in 1994. Yazov spent 18 months in Matrosskaya Tishina, according to the magazine Vlast No.41 of 14 October 1991. Sergey Fyodorovich Akhromeyev was a Soviet military figure, Hero of the Soviet Union and Marshal of the Soviet Union. 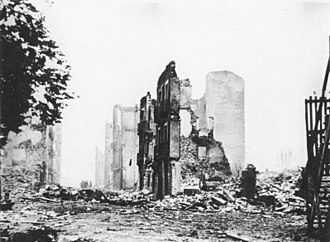 Akhromeyev was a Naval Infantry junior officer on the Eastern Front, at one point he was ordered to guard and hold a road on which the German Army would be trying to advance. Despite a bloody battle, he was able to accomplish the task, in 1984-1988, Akhromeyev was Chief of the General Staff of the Soviet Armed Forces. 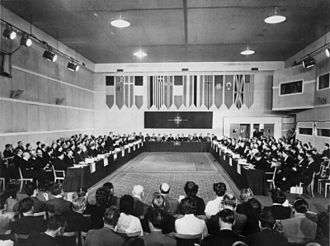 In that capacity he was involved in the talks which brought an end to the Cold War. In March 1990, he was made Advisor to the President of the USSR on military affairs, during the August Coup of 1991, Akhromeyev returned from a vacation in Sochi to offer his assistance to the coup leaders. Although he was never implicated in the coup, after its failure Akhromeyev committed suicide in his Kremlin office, hanging himself with a length of curtain cord. 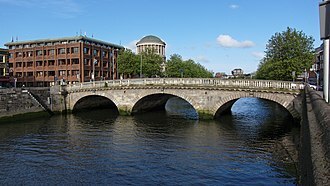 In addition to personal messages to his family, he left a note explaining that he could not continue living when the institutions to which he had devoted his life were disintegrating. 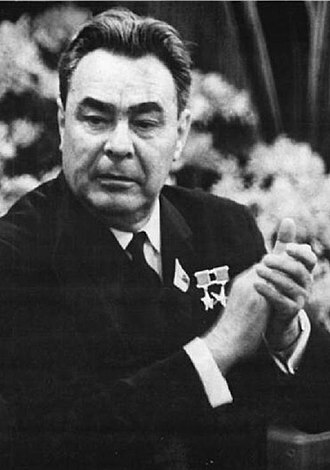 Leonid Ilyich Brezhnev was the General Secretary of the Central Committee of the Communist Party of the Soviet Union, presiding over the country from 1964 until his death in 1982. 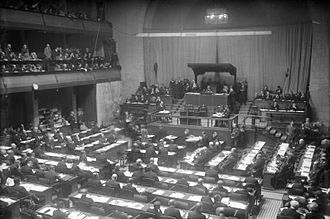 His eighteen-year term as General Secretary was second only to that of Joseph Stalin in duration, during Brezhnevs rule, the global influence of the Soviet Union grew dramatically, in part because of the expansion of the Soviet military during this time. His tenure as leader was marked by the beginning of an era of economic, Brezhnev was born in Kamenskoye into a Russian workers family in 1906. 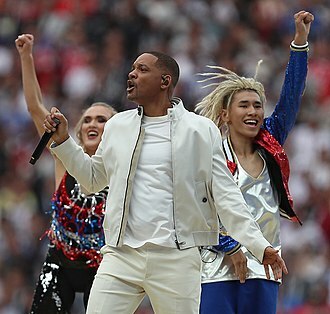 After graduating from the Dniprodzerzhynsk Metallurgical Technicum, he became an engineer in the iron and steel industry. 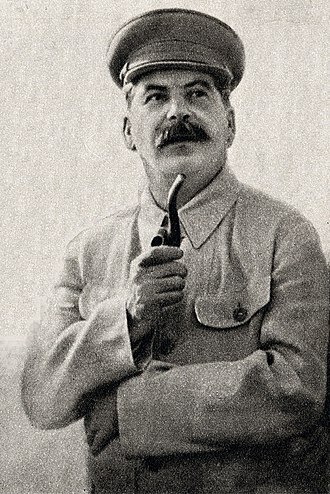 He joined Komsomol in 1923, and in 1929 became a member of the CPSU. 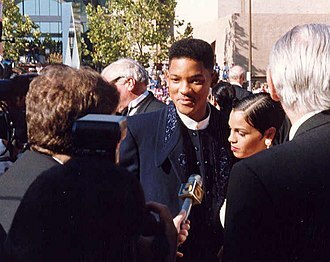 He was drafted into military service during World War II. While at the helm of the USSR, Brezhnev pushed for détente between the Eastern and Western countries. 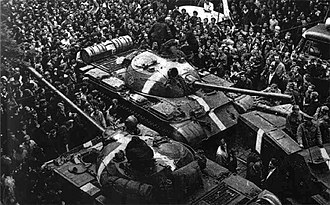 However, in December 1981 he decided not to intervene in Poland, instead allowing the countrys government to impose martial law. After years of declining health, Brezhnev died on 10 November 1982 and was succeeded in his post as General Secretary by Yuri Andropov. Brezhnev had fostered a cult of personality, although not nearly to the degree as Stalin. Mikhail Gorbachev, who would lead the USSR from 1985 to 1991, denounced his legacy, in spite of this, opinion polls in Russia show Brezhnev to be the most popular Russian leader of the 20th century. 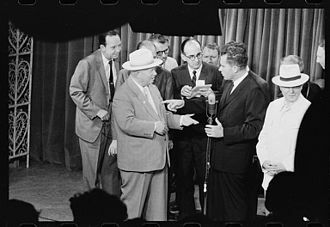 Brezhnev was born on 19 December 1906 in Kamianske in Ukraine, to metalworker Ilya Yakovlevich Brezhnev and his wife and his parents used to live in Brezhnevo before moving to Kamenskoe. Brezhnevs ethnicity was specified as Ukrainian in some documents, including his passport, like many youths in the years after the Russian Revolution of 1917, he received a technical education, at first in land management where he started as a land surveyor and in metallurgy. He graduated from the Dniprodzerzhynsk Metallurgical Technicum in 1935 and became an engineer in the iron. 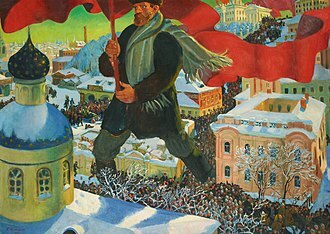 Brezhnev joined the Communist Party youth organisation, the Komsomol, in 1923, in 1935 and 1936, Brezhnev served his compulsory military service, and after taking courses at a tank school, he served as a political commissar in a tank factory. Mikhail Sergeyevich Gorbachev is a former Soviet statesman. He was the eighth and final leader of the Soviet Union, having been General Secretary of the Communist Party of the Soviet Union from 1985 until 1991 and he was the countrys head of state from 1988 until its dissolution in 1991. Gorbachev was born in Stavropol Krai into a peasant Ukrainian–Russian family and he graduated from Moscow State University in 1955 with a degree in law. While he was at the university, he joined the Communist Party, in 1970, he was appointed the First Party Secretary of the Stavropol Regional Committee, First Secretary to the Supreme Soviet in 1974, and appointed a member of the Politburo in 1979. Within three years of the death of Soviet leader Leonid Brezhnev, following the brief interregna of Andropov and Chernenko, before he reached the post, he had occasionally been mentioned in Western newspapers as a likely next leader and a man of the younger generation at the top level. 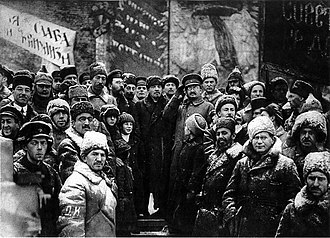 Gorbachevs policies of glasnost and perestroika and his reorientation of Soviet strategic aims contributed to the end of the Cold War. 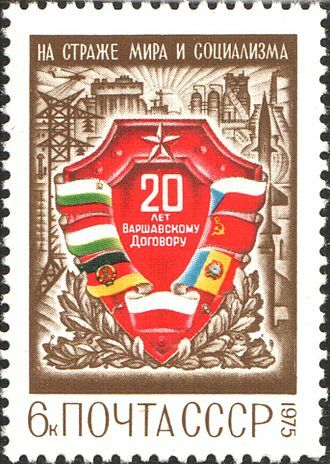 He was awarded the Otto Hahn Peace Medal in 1989, the Nobel Peace Prize in 1990 and this was Gorbachevs third attempt to establish a political party, having started the Social Democratic Party of Russia in 2001 and the Union of Social Democrats in 2007. Gorbachev was born on 2 March 1931 in Privolnoye, Stavropol Krai, Russian SFSR, Soviet Union, into a mixed Russian-Ukrainian family of migrants from Voronezh, as a child, Gorbachev experienced the Soviet famine of 1932–1933. He recalled in a memoir that In that terrible year nearly half the population of my village, starved to death. Both of his grandfathers were arrested on charges in the 1930s. His father was a combine harvester operator and World War II veteran and his mother, Maria Panteleyevna Gorbacheva, was a kolkhoz worker. He was brought up mainly by his Ukrainian maternal grandparents, in his teens, he operated combine harvesters on collective farms. 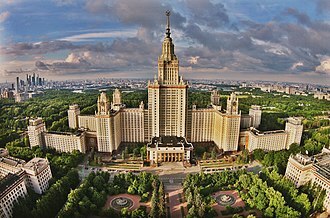 He graduated from Moscow State University in 1955 with a degree in law, in 1967 he qualified as an agricultural economist via a correspondence masters degree at the Stavropol Institute of Agriculture. 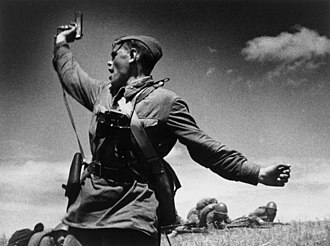 Heroic image of a Soviet political commissar of the 220th Infantry Regiment calling soldiers to an assault, Eastern Front, Ukraine, 12 July 1942. 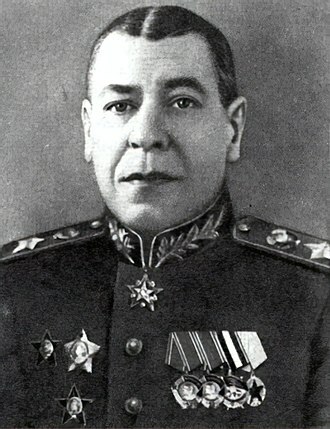 Marshal of the Soviet Union Boris Shaposhnikov.